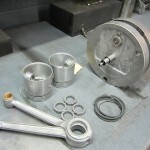 Posted in: Engine Shop. 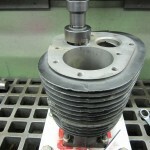 Tagged: Engine Rebuild, Indian. 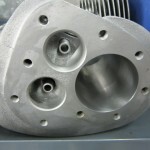 These are pictures that we took in our shop of an Indian engine that we are rebuilding for a customer. 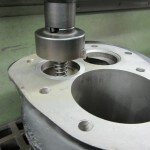 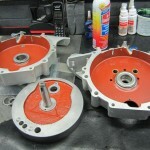 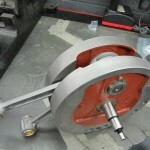 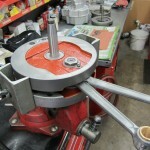 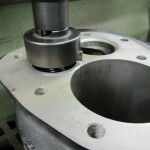 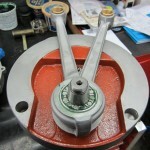 The pictures show a valve job being done on our guide and seat machine. 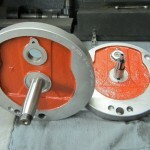 Also shown are flywheels that are being rebuilt and balanced. 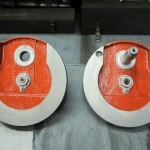 Note the red paint on the flywheels, as per factory. 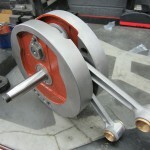 The flywheels were balanced on a dynamic engine balancer which means you have to true the them twice. 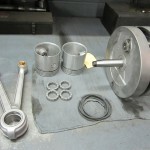 Once without the rods on the crankpin, and then once after you assemble the rods on the flywheel.